Here we are! It’s a brand new year. Which means that it is a great time to take a look at things we want to change from the previous year, including our finances. There are a few ways we can maximize our savings to create an overall better picture for ourselves in this new year. So let’s dive right in! First and foremost is to get rid of any lingering holiday debt, if you didn’t pay cash for everything. A lot of us use our credit cards during the holidays to pay for purchases because we can sometimes get better incentives to do so. I know that one of my credit cards started offering double the regular points for purchases made during a certain window of time. While the holiday credit card rewards can be pretty awesome, it only works to your benefit if you pay the card off in full each month and utilize the rewards efficiently. A lot of credit cards also give extra points for shopping local during the holiday season. While I love this local support, making sure that our cards are paid off the beginning of the year is very important to our overall financial health for the year. The faster you pay off your holiday debt, the more you will have to start throwing into your savings accounts. The beginning of the year is the best time to go through your budget and revamp it. Nobody is perfect all the time, obviously. So taking a fine tooth comb to your budget can really shed some light on places that you may have been weak last year. Taking those weaknesses and turning them into strengths can only boost your finances into a whole new realm this year. For us, we go through each category on our budget spreadsheet and see where we fell in regards to our proposed budget vs. how much we really spent. I know that our continued problems have been in the Food/Drinks category and the Luxury category. With a family of 7 and a Food/Drink budget of $800 a month (which includes alcohol!) we were running about $50 over, per month, last year. So we have to figure out some even more creative ways to work within our food budget. Neither of us wants to increase it since that would impact other categories and would not help us maximize our savings. Our Luxury category was an issue at the beginning of the previous year, but it impacted our overall budget in this category. Therefore, this year we are working on a more structured plan for our luxury trips and outings, which won’t be many, because we have higher savings goals right now. Using our example, take a look at your own categories and see where you had issues last year. This is the jumping off point to create the changes in your budget that will maximize your savings this year. At the end of last year, we started working with a personal financial trainer through The Financial Gym. I have known about this company for years, and even been on her podcast a couple of times, but I just wasn’t ready to pull the trigger yet. We made the decision to hire them to see if they could find some different ways to work with our budget that maybe I was missing. I am pretty darn good at budgeting, but nobody knows everything, and I have found that it is always good to get a fresh, outside look. Sometimes the outside perspective can show you something that was staring you right in the face, but you were blatantly missing it. This was the case with the high yield savings accounts. We had our savings in our local credit union. Usually, credit unions do have a higher interest rate than the traditional big banks, but they still don’t beat out the high yield savings accounts. Our credit union gives us a 0.75% savings rate, but the high yield accounts our financial trainer told us to look into all started around 2.00%. That may not sound like much, but it you break down the simple math it is actually 167% higher. Um, yes please! The one we ultimately chose gives us 2.40%. We just increased the amount of interest we can make on our savings by 220%, just by switching to a high yield savings account. We are very excited about this change! If you haven’t looked into switching to high yield savings accounts yet, then you definitely should. Another great tip that our personal financial trainer imparted upon us was that we needed to change how we were structuring our savings account. We each only had one, but there was no rhyme or reason to either one. We just threw whatever we could into them, whenever we could. Once she took a look at all of our finances and what our sacred cow is, traveling, she changed up how we save. Now, we have two savings buckets. One for our Emergency Fund, which she told us needs to be much higher than it currently is. The second bucket is for Traveling. She gave us specific amounts to put into each high yield savings account each month to hit our goals faster. But, the caveat is that we can’t do any traveling if there isn’t any money in the travel savings fund. Ouch! So if you have been searching for a new way to look at your savings, and really hone in on the things that drive you, create some savings buckets. Going back to using only cash can be a difficult switch for a lot of us. We were on the cash method for a few years, which worked great. But then we changed it up to start racking up reward points on a credit card instead, because we wanted to use those points for travel, aka travel hacking. Our financial trainer told us while this was all great and wonderful, it would be in our best interest to switch back to cash for a little while. This change is to help us shift our focus onto the high yield savings accounts and our long term goals. In order to do this, we have to cut some of our superfluous spending. The best way to curb superfluous spending it to switch to cash. It is more difficult to shell out cash at the grocery store, or any other store for that matter, than whipping out a credit card. But, discussing how much cash we have for the month and what we have left, certainly makes us more hyper-aware of our spending. By switching to spending ONLY cash on anything that isn’t a regular bill, we plan to save 50% more than we were before! Overall, by just taking a closer look at our budget, changing up where we put our savings, and switching back to cash, we have maximized our savings for the new year. This may sound complicated, but it really didn’t take too much energy to create these changes. We love being able to take a fresh look at our finances and save more money than we thought we could. Because of this, we are really excited to see what this New Year has to bring! 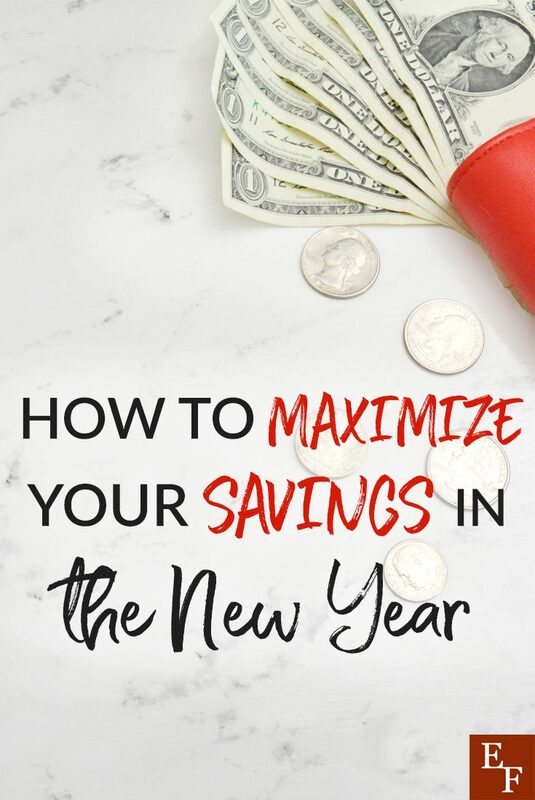 What are some of the best ways you have found to maximize your savings in the New Year?